Yesterday opened at 2474.75 and attempted higher briefly, with a bearish advance/decline from the off. The Initial resistance zone at 75.50-76.00 held and we got a liquidation break lower. The first hour range (initial balance) was broken to the downside and for the second time this week it turned at the 127.2% fib extension of that range (see below chart). This to me signals that there was a lack of long term money selling and trade was dominated by day traders. We did also see some bullish divergence in the TICK at the lows which then led to a move back to vwap and then a push back up to the open by the close. 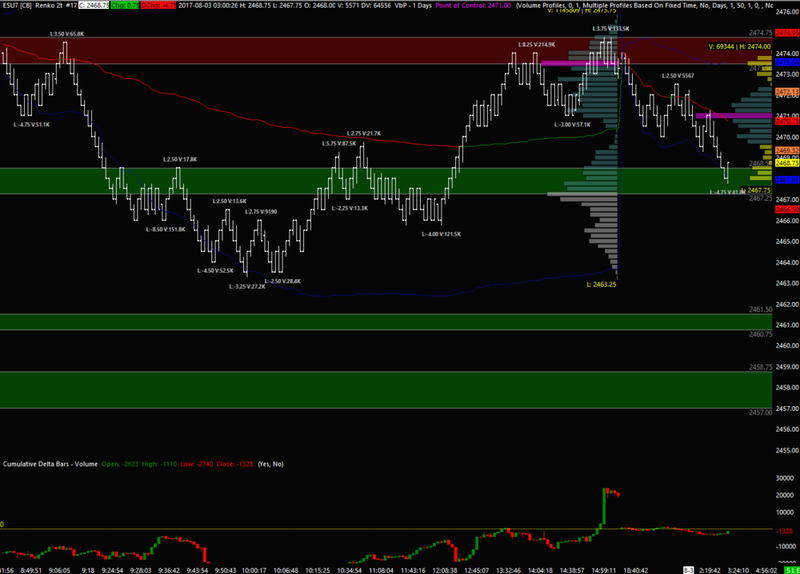 A double distribution was left on the day, split between the 70.25 LVN. There was heavy seller absorption into the 73.50-74.75 range so I am using that as IR for Thursday. IS at 67.25-68.50 being yesterday's and the composite HVN, and where the afternoon break higher started from. If IS breaks then there's a good chance it continues lower into the 60.75-61.50 zone, but will have to see in real time.